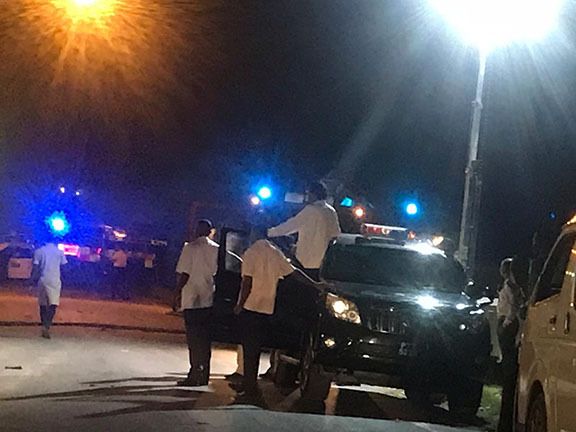 Public Security Minister Khemraj Ramjattan (third from left) overlooking the situation from outside of the holding bay at the prison last night. Just hours after three prisoners fled from the facility (see other story on page 10) , a number of prisoners were injured yesterday afternoon after they rose up against what they said were inhumane conditions in the Lusignan prison on the East Coast of Demerara. Joint services ranks guarding the facility fired gunshots during the uprising but up to press time this morning it was not clear if any of them had been injured by the gunfire. 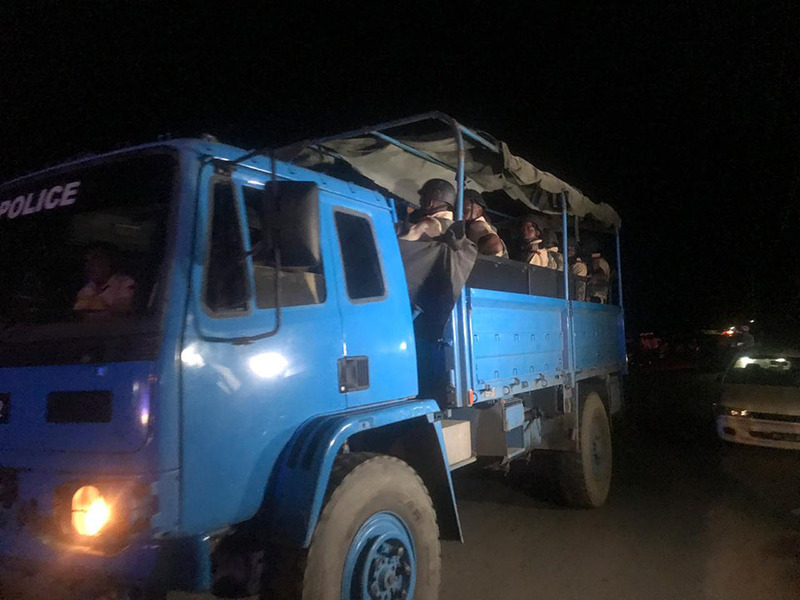 Reports coming out of the prison indicated that five to seven prisoners were injured during the unrest and were taken from the prison for medical attention. Their names were not released to the media. A vehicle carrying policemen arrived on the scene last night to provide back up security during the unrest at the Lusignan Prison. Stabroek News gathered that the unrest began yesterday afternoon sometime around 4.30. Gunshots rang out as officers who stood from the towers, guarding the hold bay, tried to maintain order. However, this did not deter inmates as they continued banging on the barriers inside the holding bay and setting fires. This prompted authorities to summon the fire service who responded and put out several fires. At one point, at around 7.32 pm, fire-fighters had to mount the guard towers to put out a fire that erupted on the northern section of the holding bay. Not being able to contain the blaze, fire-fighters had to move to mid-section of the northern fence to battle the blaze from outside the compound. As they battled the fire, inmates in the holding bay threw bottles and fragments of the paved tarmac at fire-fighters and security service personnel. The fire was put out at around 7.47 pm and the situation was brought under control. An inmate who established contact with reporters on the scene said that the unrest is another demonstration of their frustration at the treatment they are receiving. He said that they are forced to consume food that “… is worse than dog food… it is always a boil up they giving us.” He also complained of the insanitary conditions they have to live in and pointed out that the portable toilets are not emptied regularly. The inmate added that they are not satisfied with the judicial system. “It is very slow. Some of us are here for years waiting for our trial but the judicial system is very slow and it frustrating us” he stated. “This have nothing to do with the three persons who escaped… All this that has happened because we have been pushed to the limit. No one is listening to us and we have been trying but it has become too much…” the inmate said via telephone. As a result of the unrest, the Guyana Police Force deployed additional police officers and overhead security lights at the prison. Prisons Head Gladwin Samuels via telephone told this newspaper that he was working on a statement to be issued. Up to press time no statement was issued.